YouTube the way schools and teachers want it... no comments, no related videos, and only videos that you want. With YouTube for schools and YouTube for teachers learning goes viral. Brought to you by CUE, the producers of the YouTube Teachers Studio and Google Teacher Academy, the YouTube Workshop for Educators introduces participants to innovative ways YouTube can be used in education. A workshop of fast-paced presentations and hands-on activities includes experience with aggregating videos on your YouTube Channel, editing creative commons videos, creating videos for you students and "flipping" your classroom. YouTube Star Teachers share ways they have implemented YouTube tools such as Playlists, Channels, the YouTube Video Editor, the new YouTube EDU, and more. 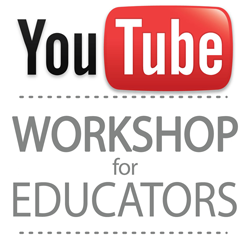 Participants who complete the event are given access to the YouTube Workshops for Educators Network, an online community focused on supporting educators as they learn more about the power of YouTube to drive student learning. CUE is an official Google Professional Learning partner.